The last recipe I've made for this month from the cookbook, Cooking From The Farmers' Market. A cold dessert, Blueberry-Vanilla Panna Cotta. Simple and easy, pretty quick to make. Of course, those blueberries are not from the farmers' market, they are imported. Unfortunately blueberries are not grown over here. Wish they were! I've made the panna cotta in the evening and left to chill overnight in the refrigerator. We enjoy it the next evening. Makes a lovely after dinner dessert. Next time I will try with our local tropical fruits! In a bowl, sprinkle the gelatin over the milk. Let stand for about 2 minutes. In a saucepan over medium heat, stir together the cream and sugar. Using a small knife, split the vanilla bean in half lengthwise. Scrape the seeds into the cream and add the pod. Heat, stirring, until small bubbles appear around the edges of the pan. Let cool briefly. Remove the vanilla bean. Slowly add the warm cream to the gelatin mixture, stirring constantly until dissolved. Stir in the vanilla extract and 2 cups blueberries and then pour into four 3/4-cup (6-fl oz/180 ml) ramekins, dividing evenly. Cover and refrigerate for 4 hours or up to overnight. Run a thin knife around the inside of each ramekin, and invert onto a dessert plate. Garnish with blueberries and serve right away. It's Potluck week at I Heart Cooking Clubs (IHCC). For this week, I've made Nigella Lawson's fabulous Italian Breakfast Banana Bread. I have made many banana breads through the years, and my favourite is one of Nigella's recipes, which uses golden raisins soaked in rum, which I have posted here, and have made it many times. She has another banana bread recipe in her cookbook, Nigellissima that I just got to try, especially when it has espresso in it! I love coffee! This is a very easy and quick bread to make. In the recipe, instant espresso powder is used. What I have are instant granules, and the first time I've made this bread, some of the granules did not dissolve completely, specks of it can be seen in the bread. But the bread tasted awesome and so "coffee-ey" delicious, that I made it again. This time I dissolved the instant espresso granules in the vanilla extract with half a teaspoon of warm water, before I mashed the bananas with the vanilla-coffee extract. The bananas are very ripe and sweet, so I have reduced the sugar slightly. This is one delicious banana bread! Nigella nails it again with this recipe. Moist, soft, full of banana flavour and that coffee taste in each bite is just delicious. Perfect with a cup of hot steaming coffee. Even though the recipes uses 4 teaspoons of the instant espresso powder, just as Nigella says "And even though I add quite a bit, the flavour doesn't overwhelm at all. It's there, but as a hint, and the subtle bitterness of the coffee undercuts, most elegantly, the creamy sweetness of the bananas". I have made this bread three times already. Believe me, one loaf will be gone pretty quick! This is one recipe that I urge you to try, especially if you are a coffee lover! Slip a baking sheet into the ovenb, and preheat to 170C/gas mark 3. Get out a loaf tin, and line it with baking paper or a loaf tin liner, or lightly oil it. Mash the bananas with the vanilla extract and salt and then beat in the oil. Now, beat in the eggs, one by one, followed by the sugar. Mix the flour with the bicarbonate of soda and esperesso powder, and beat these dry ingredients into the runny batter. Pour the batter into your prepared loaf tin, and pop it into the oven, on the baking sheet, and bake for 50-60 minutes, or until slightly coming away at the sides and bulgingly risen. A cake tester should come out clean, barring the odd crumb. Wait for a day or at least half a day before slicing into it. An easy stir-fry dish. I have replaced the beef with pork fillet. And have used more garlic cloves, probably about 8. If you love garlic, then 3 cloves is not enough! A tasty vegetable stir-fry, great dish as part of a main meal, with rice. Cut the beef across the gtrain into strips 3 inches (7.5cm) long and 1/4 inch (6mm) thick. In a bowl, stir together the cornstarch, salt, sugar, baking soda, and 2 tbsp water. Add the beef and stir until well mixed. Let stand at room temperature for 30 minutes. In a frying pan over high heat, add the canola oil. When the oil is hot, add the garlic and red pepper flakes and saute until crisp, about 1 minute. Transfer to paper towels. Add the beef, broccoli and 2 tbsp of the wine to the pan and cook until the beef is opaque and the broccoli is tendeer, about 5 minutes. Add the soy sauce andf the remaining wine and stir for 1 minute. Transfer to warmed plates and accompany with steamed rice. This month's selected bread recipe at Rose's Bread Bible Bakers, is Irish Soda Bread. Rose's Bread Bible Bakers is a group of bloggers who are currently baking from Rose Levy Beranbaum's book, The Bread Bible. Rose's recipe calls for black raisins soaked in whiskey, drained before adding to the dough. The whiskey is then used to flavour softened butter which is used as a spread to enjoy slices of the soda bread later. The dough is made up of unbleached all-purpose flour, or a mixture of all-purpose flour and whole-wheat flour, sugar, baking soda, salt and buttermilk. I have used unbleached all-purpose flour. The dough is very sticky, but, Rose has advised to avoid adding extra flour, and only flour your hands if absolutely necessary. So I flour my hands, shape the dough and try to smooth out the surface as best as I can, even though I've seen that most Irish Soda Bread has a rustic and bumpy surface. I measured the shaped dough to a 6" round, about 1-3/4 inches in height as instructed. Slash a cross on the surface and bake until golden brown and cooked through. 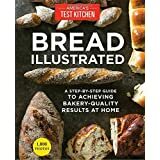 I measured the baked bread, and it is now 7" by 3-inch high bread, just as Rose says! Moist, not too sweet and the raisins are plump and fragrant from the whiskey. An excellent bread! The Irish Whiskey Butter. Reserved whiskey from the raisins is heated with some sugar in the microwave until the sugar melts. Leave it to cool completely and whisk into softened butter until incorporated. A slice of Irish Soda Bread spread with Irish Whiskey Butter. What a tasty boozy treat for afternoon tea! The bread is even good on its own. This recipe is a keeper! Up next in November, we will be baking Rich and Creamy Ginger Scones, page 143. 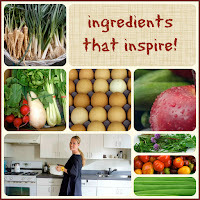 This week at I Heart Cooking Clubs (IHCC), the theme is "Ingredients That Inspire". We are cooking with our current featured chef, Heidi Swanson and many of her recipes has ingredients that I have never cooked or used before, so I am inspired by the varieties of ingredients in her recipes. But one ingredient that stands very clearly above the rest is, the usage of fig leaf. I have one fig plant for the past 2-1/2 years, and I have never thought of using the leaves for cooking, other than to look forward to the fruits and admire the pretty shaped leaves. Heidi has a photo of the reverse side of the fig leaf on her blog post. I was thinking why does she photographed the leaf on the reverse and not the front. Now I know. The reverse side is much more attractive and pretty to look at, with the white veins clearly stands out against the green of the leaf, the contrast is rather attractive. I plucked one more leaf and took a sniff, but could not get get any aroma or smell anything from it. I then tear it and could get a faint lovely scent. Now, I am really curious to use it in cooking. Heidi got her inspiration to use fig leaf from one lady called Claudia Schwartz, whom she meets nearly each week. You can read about it from her blog. Heidi uses the fig leaf, on top of simmering coconut rice. You would want to use unsprayed leaf. With homegrown ones, you need not worry! Brown rice is mixed with coconut milk, water and salt. I cooked the rice using the rice cooker. When the rice has come to a boil, place the fig leaf on top of the rice, cover the pot and continue to cook until the rice is done. If you are cooking the rice over the stove top, be sure to check on the rice regularly to ensure that the bottom does not burn. Brown rice needs a little extra water than the regular jasmine rice. I've cooked one cup of rice and used about 1/2 cup coconut milk plus 1-1/3 cups water. Heidi has served her rice with pan-fried tofu, sliced scallions, sliced dried figs and toasted pepitas. I pan-fried the tofu with some chopped garlic and a generous pinch of coarse pepper flakes with a pinch of salt. The chopped scallions remain but I've omitted the sliced dried figs (did not have any!) and the toasted pepitas. I have however added lots of crispy fried shallots, and half an egg. Now this is not the regular hard-boiled egg, this is my homemade Salted Egg, which is a very Asian ingredient. Whole duck eggs, still with the shell, are soaked in salty water brine with some Chinese wine added in, and left to preserve for 21 days. Remove the eggs from the salty brine, rinse the eggs and boil them as you would for hard-boiled eggs. 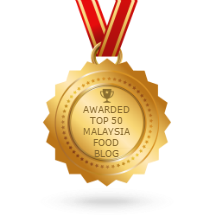 We usually eat it with rice and congee, and as an ingredient in cooking. The fig leaf infused rice, smells very nice. I have always use pandanus leaf to cook coconut rice, which is common, but this is entirely a new way with the usage of fig leaf. While pandanus leaf have a stronger fragrant aroma, the fragrance of the fig leaf is light and lovely in its own way. Heidi describes it as "Added to a pot of simmering grains, the fig leaf imparts a subtle flavor and perfume to the entire pot. The best way I can describe it - a bit green, and a bit nutty. But more like raw pepitas than walnuts. And coconut, but green coconut. There are some of those notes as well". Coconut rice is a popular food over here, which we call "Nasi Lemak", and is eaten served with spicy sambal, crispy fried anchovies, hard-boiled eggs, cucumber and crunchy peanuts. So this take with the fig leaf infused coconut brown rice, eaten with the tofu and all the rest of the topping is something that is very different for me. And I got to say that I've enjoyed this meal very much! Everything complements each other in a delicious way! Now instead of looking out for only the fig fruits, I'm looking at the leaves in a totally new way! Heidi has some other suggestions on how to use the fig leaves, by infusing them in the cream when making ice cream or gelato or use it to infuse some vodka to make fig leaf vodka tonics. I think I'll be trying it on ice cream next. Start by rinsing the rice. You can do this by putting the rice in the thick-bottomed pan it is going to cook in. Fill the pot halfway with water, swish the rice around (the water will get cloudy), and pour out the cloudy water. Repeat a few times. To the rinsed (and drained) rice add the coconut milk, water, and salt. Stir to combine. Place the pot over medium high heat and bring the liquid to a boil (uncovered). Stir once or twice to prevent the rice from scorching down at the bottom of the pot. Once the liquid comes to a boil reduce the heat to a low, low simmer, place the fig leaf on top of the simmering rice, and cover the pot tightly with a lid. Simmer until the grains are tender, the timing will differ based on your rice, but typically 45 minutes to an hour. Remove from heat, and allow to sit for ten minutes or so. Fluff with a fork, and your rice is ready to serve. Serve topped with any or all of the following : lots and lots of shredded scallions, toasted pepitas, sliced dried figs and pan-fried tofu. The next recipe I've made from Williams-Sonoma : Home Baked Comfort by Kim Laidlaw is Nutty Raspberry Financiers, a recipe, courtesy from La Tartine Gourmande. Position a rack in the middle of the oven and preheat to 350F (180C). Line 8 standard muffin cups with paper liners or grease with butter. Line a baking sheet with parchment paper. Spread the almond meal and hazelnut flour on the prepared sheet and bake until fragrant, about 5 minutes. Let cool. In a bowl, using a whisk, combine the toasted almond meal and hazelnut flour, amaranth flour, granulated sugar, and salt. Split the vanilla bean and scrape out the seeds with the back of a paring knife. In a small saucepan, combine the vanilla bean and seeds with the butter. Cook over medium heat until the butter melts, starts to brown lightly, and has a nutty aroma. Let cool for 3-4 minutes. Beat the egg whites into the dry ingredients. Add the melted butter mixture in 3 additions, mixing well after each. Stir in the vanilla extract. Divide the batter between the muffin cups and top with the raspberries, pressing them gently into the batter. Bake until the financiers are lightly golden brown, 18-20 minutes. Remove from the pan and let cool on a wire rack. Dust with confectioners' sugar before serving. 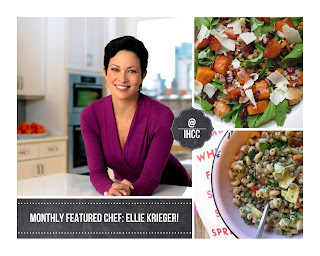 This week at I Heart Cooking Clubs (IHCC), the theme, Monthly Featured Chef : Ellie Krieger, is the last one in line for the monthly featured chef theme. Starting from next month, the theme will be changed to a featured ingredient or dish, and we shall have the option to choose to cook with any of our past and present featured chefs at IHCC. 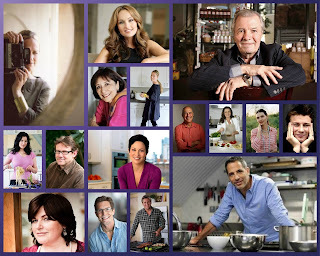 It has been awhile since I've cook with Ellie Krieger, and I have been thinking of making some snacks, especially on the afternoons that I want something light yet healthy to nibble on. Of course, you can count on Ellie Krieger for her fabulous healthy recipes and found just the right snack to make, Energy Bars. Half of the baked bars with sesame seeds spread over the top, leaving the other half as it is. These bars are pretty easy to make, it comes together pretty quickly. What you need is a food processor to pulse all the ingredients (except maple syrup and eggs), until finely chopped. Then pour in the eggs and maple syrup and pulse to a thick paste. Spread onto a very well greased baking tray, bake for 20 minutes until golden brown. Easy peasy! I did not have any dates, so I used dried cranberries. Also did not have any maple syrup, so I've used honey. My food processor could not pulse all the ingredients at once, so I have divided into two and pulse each half separately, mixing them together before adding the eggs and honey. One thing to note is, to cut each dried apricots into three so that it is easier to pulse in the food processor into smaller pieces. (The whole apricot got stuck in between the blades, so I got to remove them and cut into three pieces each, before proceeding to pulse them together with the other ingredients. This was done pretty quickly as there was only half a cup of whole dried apricots). As I was spreading the thick paste into the baking tray, I was thinking of a layer of sesame seeds coating the top of the bars. I happened to have some toasted sesame seeds in a jar, so I spread them over half of the bar, leaving the other half as it is. I baked the bars for 22 minutes. These bars cut pretty easily. It stays together and not crumbly when cut. Which one would you prefer? With or without the sesame seeds? I like them both. Just the right amount of sweetness. The ones with sesame seeds has an extra nutty seedy bite. The ones without is equally good. The family are not fond of energy bars like this, so I knew that when I make this, I am going to be the one that is going to finish most of it. No complaints from me! I like to munch on bars and flapjacks with a cup of warm tea in the afternoon. I packed some pieces for my nephew and the rest are for me to enjoy for a few afternoons, and in between! Preheat the oven to 350F. Coat a 9 x 13-inch baking pan with cooking spray. Place all the ingredients, except the maple syrup and eggs, in a food processor and pulse until everything is finely chopped. Add the syrup and eggs and pulse until the mixture is well combined. It will resemble a coarse paste. Transfer to the baking pan and spread evenly to cover the bottom. Bake until lightly browned, about 20 minutes. Allow to cool for 15 minutes, then cut into 24 bars. 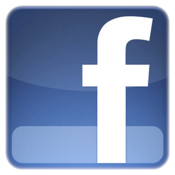 Store in an airtight container at room temperature for about 3 days or wrap individually and freeze for up to 3 months. Bought some lovely thin asparagus spears from the farmers' market, to make this omelet dish for dinner. Simple and quick dish to cook. The asparagus are first trimmed of tough ends and cut into one inch pieces. The recipe calls for the asparagus to be boiled in salted water for about 3 minutes. But I have however use my simpler method. I placed the asparagus pieces in a microwaveable bowl, sprinkle some water and a pinch of salt. Cover and microwave on high for 1 minute. Drain and proceed with the recipe. I use Chinese chives from my garden pot. The omelet is cooked over the stove for a few minutes, then finished the cooking in the oven until the omelet is set. Cut into wedges and serve. Very nice omelet. We had this as part of a meal with rice, and the family likes it. Position a rack in the upper third of the oven and preheat to 325F (180C). Cut the asparagus into 1-inch (2.5cm) pieces. Bring a saucepan of salted water to a boil, add the asparagus, and parboil for 3 minutes. Drain, rinse with cold running water, drain again, and pat dry. (I microwaved the asparagus pieces, place in a microwavable bowl, sprinkle some water and a pinch of salt, cover and microwave on high for 1 minute. Drain). In a medium frying pan over low heat, warm 2 tbsp of the olive oil. Add the shallots and saute until softened, about 8 minutes. Add the chives, garlic, and asparagus and saute until the asparagus is tender, about 2 minutes. Remove from the heat. In a bowl, whisk the eggs until blended. Add the asparagus mixture and season with salt and pepper. In an 8-inch (20-cm) ovenproof nonstick frying pan, warm the remaining 2 tbsp olive oil over medium-high heat. Add the egg mixture and reduce the heat to medium. Cook until the eggs are set around the edges, 5-7 minutes. Transfer to the oven and cook until set, 7-9 minutes. Let cool briefly. Invert the omelet onto a large plate. Cut into wedges and serve right away. I'm baking through Home Baked Comfort by Kim Laidlaw as a personal project of mine, and the next recipe I've made is Super Banana Bread. Another keeper recipe. If you have some leftover bananas that are begging to be used, make this quick bread! Position a rack in the middle of the oven and preheat to 350F (180C). Generously butter two 9-by-5-inch (23-by-13-cm) loaf pans. In a bowl, sift together the flour, baking powder, baking soda, salt, cinnamon, and nutmeg. In a large bowl, whisk together the bananas, eggs, brown sugar, sour cream, vanilla, and butter. Add the dry ingredients and stir to combine. Divide the batter between the prepared pans and sprinkle with turbinado sugar. Bake until a toothpick inserted into the centre of a loaf comes out clean, about 35 minutes. Let cool slightly in the pans, then turn the laoves out onto a wire rack to cool.